When Marc Marquez gets off his bike and sits in the corner of the Repsol Honda garage, the first person he talks to is Santi Hernández. His track engineer since his time in Moto2 was already a premier class title winner with Álex Crivillé, with whom he worked as a suspension technician. After the spectacular start to the season in Qatar, Hernández reviews the first round of the year and explains how the series has evolved. Many know you as Marc Márquez’ track engineer, but others may remember you working with Álex Crivillé as a suspension technician. What do you remember about that time? What was it like for a young man in his twenties to work on the Repsol Honda Team? “Marc surprised me from the first day I was paired with him, because of a comment he made about the bike and how he expressed himself. I always say the same thing: Marc surprises me every day. It’s not up to me to tell him what needs to be improved. “As Marc said, the new engine has helped us to have a better top speed and better acceleration, which were points where we have struggled most in recent years. We are closer to the Ducati now and we have overtaken other manufacturers, and that is important. It is very interesting, because when you can gain time on a straight, you don’t have to sacrifice so much at other, riskier points of the track. It’s ‘free’ time, because everyone knows how to open the throttle and you don’t have the risk of having to make back time on the brakes. 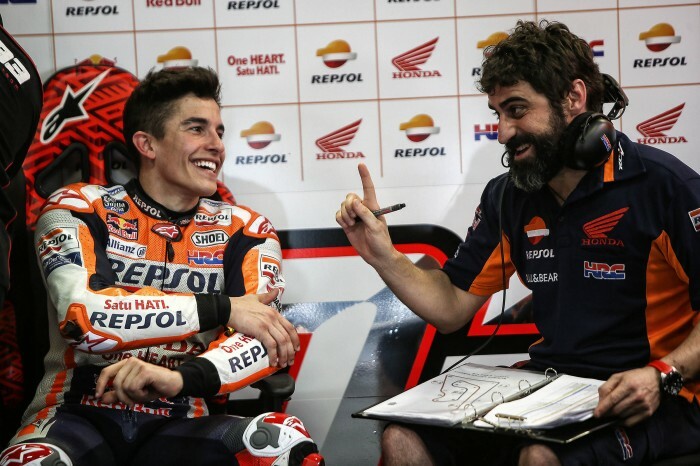 After the winter and the difficulties Marc had at Sepang, did you expect him to finish second and 23 thousandths off the win? The difference between the top five in Qatar was 0.6 seconds. Do you think the World Championship will be tougher than ever this year?